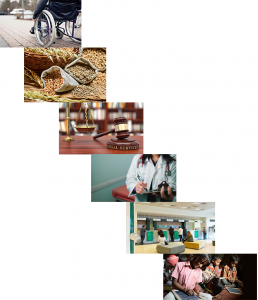 Broadly there are two frameworks of labour law enactments that cover organizations. One is The Karnataka Shops and Commercial Establishments Act (S&E), which is a State legislation administered under the Department of Labour. Second, is the Factories Act 1948, central legislation which covers all manufacturing entities that employ 10 or more persons using power, where prior approval is required from a building, safety, health, pollution, power standpoint. Government Offices – Central and State government Offices including those of local authorities are excluded. This does not cover commercial establishments of the government. For example, Karnataka Soaps and Detergents Ltd, although owned by the State, it’s offices are expected to adhere to the S&E Act. 2. Public Utilities such as railways, railway dining cars, water, power, public conservation, sanitation, postal, telegraph, telephone, public lighting, etc. 3. Disability Services – Organisations engaged in the treatment and care of the handicapped or mentally unfit. 4.Food Corporation of India and all it’s facilities. 5. 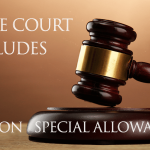 Legal Services – Lawyers and law offices that employ not more than 3 persons. 6. Medical Services Doctors and clinics that employ not more than 3 persons. 7. Banking Services and their Offices including branches. 8. 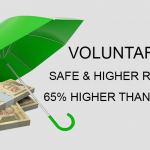 NGO’s doing a charitable activity/Non Profit Organisations. 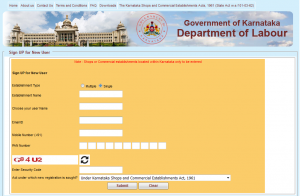 New shops or commercial establishments in Karnataka are required to apply for Karnataka Shops and Commercial Establishment Act Registration within 30 days of commencing business. Commencement of business is the date on which the operations commence, although the date of incorporation or formation may precede it. The determination of the commencement of business date is a matter of circumstance and the unit could be called upon to corroborate. Some of the ways to support such a determination is a date of production from production records, date of hiring from Attendance, Salary Register and similar records, Invoices, and Sales Register and may require to be further substantiated by the books of accounts and bank statements. 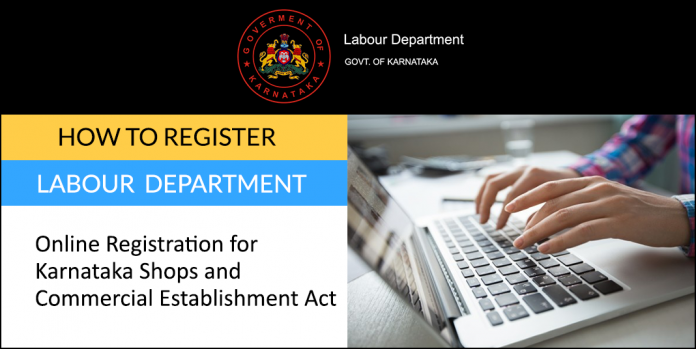 Depending on the legal entity, be it a Proprietorship, Partnership Firm or a Limited Company, it is the Proprietor, Partner, Director or such official of the establishment who would be the responsible person expected to register the establishment with the Department of Labour. At the time of first-time registration, you are to furnish the PAN No of the establishment and your mobile number. In the sign-up process, your user name and password credentials will also be set up. If for any reason, the user is not able to get the User Name & Password on his mobile or email due to technical glitches in the department portal, he can call the PRO section or he can visit the dept to collect the same. The user has the option to change his password in the r the menu after logging in under– Edit Profile. After changing the password, the user should log in again to the dept portal and need to select the – Menu– Registration (Part A). Once the user selects the option Registration (Part A), the user will be prompted to select the options to fill in the application form. Jurisdiction of the establishment where it is situated and concerned circle in the S&E Department. The area is based on the ward’s of the city, a town which is mapped to Circles in the Labour Department. Along with the online form and information filled in, the following are the supporting scanned records to be furnished. Child Labour Declaration affirming that the unit does not employ any children below 14 years. Authorization Letter to represent the establishment before the Department of Labour. After filling up the application form, the user is required to pay the prescribed Fees. 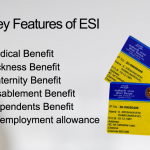 The fee structure is a slab system based on the range of the expected number of employees envisaged. Payment of the prescribed registration fee would take you to the State Government treasury called Khajane II at the following link. If an Establishment is having different branches in the city or in the same state they should obtain separate Shops & Establishment registration for each branch. Shops & Establishment Licence is renewed once in Five Years. Annual Returns – In Form U is to be filed on or before 31st January every year. This covers information for the Calendar year Jan to December and contains information on the employees, salary data, leave data, contract employee data, etc and can be submitted online. 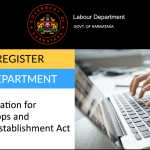 The establishment is required to display at the reception of its facility the following abstracts so that all its employees are made aware of their rights and duties under the following labour related enactments. Single window – Common Registration Service on the e-biz Portal of DIPP for registration 5 central laws. 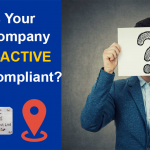 The S & E Act and the Department of Labour attempt to regulate those who have voluntarily registered themselves as they have information on their location, nature of business and declared a number of employees/workers. The Factories Act, likewise covers those manufacturing, employing 10 or more persons. However, with no strict zoning regulations in urban centres and mushrooming of business and retail entities encroaching into residential areas, whether the Department has a framework to identify the very many entities who do not register, or validate those who employ less than 10 persons in some manufacturing or assembly process are some of the open questions on enforcement of the S & E Act. It would be observed that the information sought through the return or the Registers may be pertinent to the regulator and the establishment, but due to the archaic formats and forms of physical registers, establishments may have all the information but may not update the manual registers as it being a tedium and hence throw themselves vulnerable during any surprise labour inspection. They may end up with a list of defaults on the procedure but not on substance and thereafter become further vulnerable, as any labour Department notice is to be personally attended to. This becomes further compounded as it has come to many a establishments consternation that a written submission being handed over in the S & E Department, unlike many other Government Departments are not received nor acknowledged by them. Therefore, the issue becomes even more complicated and frustrating as the substance of the issue is addressed but not the form and the process of redressal is loaded against the establishment. Karnataka State would do well to adopt the Central Labour Department digital infrastructure of Shram Suvidha and digitize all the S&E compliances and returns.